Dinosaur Comics - April 5th, 2007 - awesome fun times! –"I need to get inside my dog's head!" - Me! April 5th, 2007: Tuesday's comic was about out-of-genre cover songs, and ended with T-Rex talking about a particular cover song that, I am sad to report, did not yet actually exist. THAT IS, UNTIL TODAY! Kristopher, who is by all accounts an awesome young chap, sent this to me, and I think you will agree it's pretty rad. I'm not sure what's going on with the theremin (I pictured it as leaning more towards haunting and less towards "robot falling down the stairs") but it still sounds totally cool and fits in nicely with the steel drums! 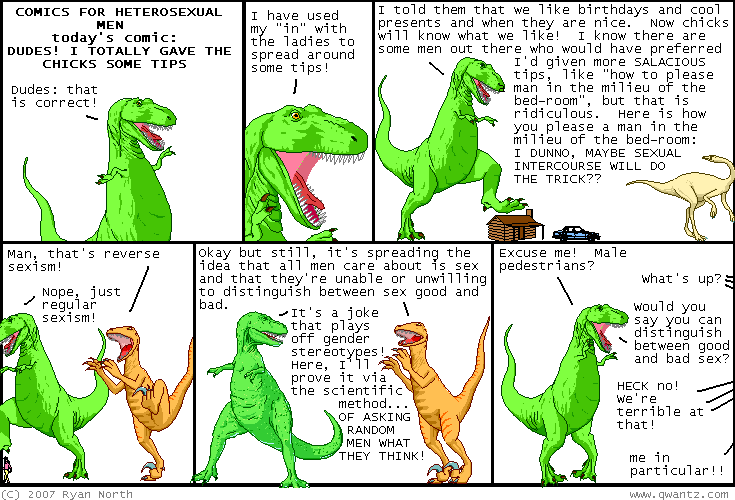 If there was a theme song to Dinosaur Comics I would want it to sound something like this. Also if I die within the next six months please to play this at my funeral as the casket is being lowered.